According to the news from Domain.cn on May 29th,Technology.ie is giving away 20 free tickets to DomainFest. Their website posted today, Technology.ie has got twenty tickets to give away to DomainFest Bulgaria next week. It’s just one of the events which form part of Bulgarian Internet Week, in a country which ranks second in the world for Internet use (average: 16 hours per person per week). There is a podcast with Jothan Frakes of NamesCon and DomainFest. Jothan discusses New gTLDs being the new normal and starts out discussing a growing interest in domaining making reference to the attendance of NamesCon for 2015. In its 30 April announcement, ICANN noted its intention to disclose to affected users the identity of any user(s) that viewed their information without authorization by May 27th 2015. This activity has been completed. ◾Requested these users certify that they will delete or destroy all information obtained and that they have not used and will not use the information or convey it to any third party. In addition, ICANN has provided the affected parties with the name(s) of the user(s) whose credentials were used to view their information without their authorization or by individuals that were not officially designated by their organization to access certain data. Based on the information that ICANN has collected to date our investigation leads us to believe that over 60 searches, resulting in the unauthorized access of more than 200 records, were conducted using a limited set of user credentials. ◾Access information of an organization with which they were affiliated. At the time of the access, they may not have been designated by that organization as an authorized user to access the information. We will continue to provide information and respond to questions from affected parties as we continue our investigation. The New gTLD Applicant and GDD portals contain information from applicants to ICANN’s New gTLD Program and new gTLD registry operators. No other systems were affected by this issue. ICANN sincerely regrets this incident. We continue to deploy security-based updates on a regular basis. Enhancing the security controls and privacy of the ICANN portals is part of a broader, multi-year effort to harden all of ICANN’s digital services. According to the news from Domain.cn on May 29th,Domain Movers consistently delivers unique domain name data two times a week here on TheDomains, which contains recently registered, acquired and simply moving domain name from some of the largest companies around the world. Daniel J. Edelman, Inc. (PR firm) has registered the domain name PaypalReady.com . This was a little odd to me as Paypal almost always registers its own domain names but eBay and Paypal are separating companies and they may have hired Edelman to help in the process. eLance/oDesk which had recently rebranded to Upwork, which I covered in an earlier article with them acquiring Upwork.com, have now secured the plural domain name Upworks.com. That domain was registered in 2008 and was owned by a “Modern Outlook S/B” according to whois records. Fluor Enterprises Inc. has acquired the domain name Flior.com . Based on whois records, it appears the domain reached expiration and CSC Corporate Domains secured the domain during an expired auction. The company uses Fluor.com as its main domain name. AUSTRALIAN HEALTH & NUTRITION ASSOCIATION LIMITED has acquired the domain name Wholicious.com from ComDots.com. The domain name was registered November 16, 2005 and had a make offer listing with the minimum offer at $999. GoDaddy has sold the domain name VirtualAds.com from its Marchex portfolio. They have also sold the domain name MostExpensive.com. Nokia Navteq (Here.com) acquired Reach Unlimited Corporation in December 2010 and has now just taken control over the main domain name, Trapster.com according to whois records. The domain name no longer resolves. Google Inc. has registered the domain name GoogleLifeSciences.com . There is “potential” that Google may have acquired the domain name LifeSciences.com as that domain name was owned by Telepathy Inc. up until August 9, 2014 when the domain went into whois privacy at GoDaddy. Shutterstock, Inc. has registered the domain name HighResVideos.com, which had recently expired. PharmIt.com has been acquired by a currently unknown MarkMonitor client. The domain was owned by Domain Dakini, Inc. and has been registered since December 3, 2004. Tumblr, Inc. has registered the domain name PostItFwd.com. To note, I have seen 3M actively protects its Post It trademark…. but on the flip side, BuyDomains owns PostItForward.com and has it listed for sale for $5,788. Build-A-Bear Workshop has registered the domain names HoneyGirls.org and HoneyGirls.info . They do not currently own the .com or .net domains. Penske Automotive Group acquired the domain name PremierTruck.com about December 5, 2014 from WebContents, Inc. . A “Premier Truck Sales, Inc” owns PremierTruck.net and doesn’t appear to be associated with Penske. Penske System, Inc. registered PremierTruck.org and the .info . The plural domain PremierTrucks.com was also acquired by Penske about February 7, 2015 from BuyDomains.com. They have also registered the domain PremierTruckGroup.org and currently do not own the .com as another “Premier Truck” owns that domain. Dr. Pepper/Seven Up, Inc. registered the domain names Sell7Up.com, SellDps.com, SellDpsg.com and SellSnapple.com. SummerOn.com has been acquired by secret domain buying service The Treadstone Group Inc. for a currently unknown CSC Corporate Domains client. The domain was registered January 25, 2014 at GoDaddy. TwoZero.com has been acquired from a Jeremy Baxter, also for a currently unknown CSC Corporate Domains client. The domain has been registered since August 19, 2002. WellbeingConnect.com has been acquired from BuyDomains.com, also for a currently unknown CSC Corporate Domains client. The domain was registered on April 21, 2014. Levlad, LLC used a UDRP on the domain name NaturesGate.com from a Port Media Holdings LTD. The law firm Knobbe Martens Olson & Bear, LLP was used to secure the domain name. The domain was using Hit Farm parking (which is closed) and was listed for sale at Sedo. The UDRP was filed on May 12, 2015 with a status of “Withdrawn”. Levlad, LLC filed for a trademark for Nature’s Gate on March 15, 1979 and there was a opposition in June 1981. In 2004, Levland Incorporated filed a word mark on Nature’s Gate Organics Fruit Blend. They also filed a mark for a logo in 2011 and a word mark again in September 2011. NaturesGate.com was registered on December 9, 2001. CloudAdvice.com has been acquired by a currently unknown CSC Corporate Domains client. The domain was owned by a Michael Perrone for several years and on March 16, 2015 the domains whois switched to a Elad Blestein of PandaPepper LTD and by April 22, 2015 whois changed to “On behalf of a CSC Client”. Gartner, Inc. owns the domain name CloudAdvice.org and .info which were registered on March 2, 2015 and those domains are also registered at CSC, so they are the likely entity who acquired the .com domain name. i4C Innovations, Inc. has revealed that they were the buyers of the domain name Voyce.com, that was purchased from an Ian Voyce of London about May 4, 2015 which I reported earlier but the buyers were unknown at that time. They have since launched a website on the domain name and are offering a wearable band that helps monitor your dogs health and wellness. i4C Innovations is a subsidiary of Intersections Inc. and is headquartered in Chantilly, VA.
Home Box Office (HBO) were the buyers of the domain name RealTimeBlog.com from HugeDomains.com that I reported earlier. They have since launched a website on the domain name, Real Time with Bill Maher Blog. Interesting to note, the domain name RealTimeBlog.com is currently redirecting to the domain name Real-Time-With-Bill-Maher-Blog.com, so I would consider this a domain name upgrade! Not often you see a domain name with 5 hyphens in it! HBO registered the 5 hyphen domain on December 21, 2010. InkTV.com has been has also been acquired by Disney Enterprises. The domain name was for sale using DomainNameSales.com and has been registered since September 21, 2005. They have since moved this domain “to hiding” at GoDaddy under privacy protection… but I noticed the move when it happened and who was behind it! The domain has been registered since August 30, 2001 and was listed for sale at DomainNameSales.com and registered at Uniregistry. Walker IT Group, LLC has acquired the domain name WalkerTechnology.com from Mike Mann’s DomainMarket.com. Amazon Technologies is making a play on the term Amazon Prime Choice and registered many domains relating to it like AmazonPrimeChoice.com, AmazonPrimeChoices.com, AmazonsPrimeChoice.com and AmazonsChoiceOnEcho.com for an example. Jude.org has been acquired by a currently unknown CSC Corporate Domains client. The domain name was owned by The Business Centre according to whois records, then jumped to Jim Jones with DomainNameSales Corp and a “payments” email address at DomainNameSales.com and then to generic CSC data. According to whois records, the transaction took place on May 16, 2015. To note: ALSAC St. Jude, owners of StJude.org would be a potential buyer as they are also a CSC client. Bristol-Myers Squibb Company has acquired the domain name LungCancerGuide.com from HugeDomains.com. The domain was registered on January 30, 2013. The domain name had a listing price of $2,395. Hub International Limited has obtained the domain name My-Hub.com. The domain name was parked with Sedo Parking and has been registered since February 4, 2013. “”With over 288 million registered domains finally everyone has access to these “hidden” domains. Undeveloped is changing the domain industry by making the buying and selling of domains transparent, easy to use and secure. “For domain sellers, Undeveloped provides an easier way to put domains in front of a prospective audience. We instantly set up this beautiful for sale page for you on your own domain name that starts organically attracting domain buyers for you . Besides that it just takes a couple of clicks to start selling your domains on Undeveloped as they provide easy-to-use portfolio management and negotiation platform facilitating domain sales. “We were driven by our own experiences trying to buy and sell domain names, to make the process less convoluted”. “How many times have you wanted to buy a domain only to find the page covered in ads and no idea who the owner is? Personally I’m not sure how this marketplace is any different than Sedo, Afternic or Domainnamesales.com all of which offer domain holders a non-parking type of for sale page and I’m pretty uncomfortable with any of my domains to be included in a marketplace without my agreement. “In the last year, more than 48,000 .NINJA domain extensions have been secured, and 35 percent of domain names point to active websites. 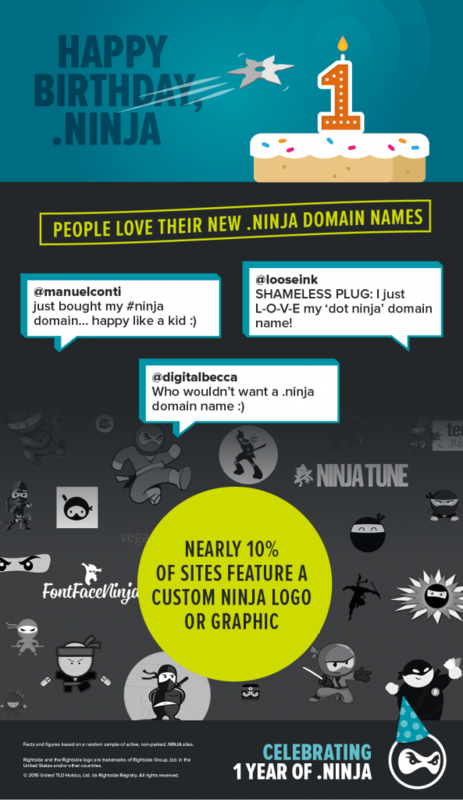 .NINJA is one of the top 25 most registered new TLDs and is rapidly growing among marital arts studios, business and creative agencies such as internetmarketing.ninja, a marketing agency out of New York that offers marketing and SEO services, content creation, social media marketing and digital asset creation.” according to the release. That is a pretty impressive number in a year… Update: if that number was correct. Although Google displayed that amount, I was corrected in the comment section due to a poor use of my search hack. Upon further research, and clicking through 31 pages of results, that is where the results stopped. So there are a little over 300 indexed .ninja domain names. You can read the full article from Rightside here. According to the news from Domain.cn on May 29th,Wynn,the Bellagio,the Borgata, the MGM, the Mirage and the Aira are just a few of the famous Casino’s which registered their name in the new gTLD .Casino extension during the Sunrise period. Each domain extension has to give first shot to trademark holders who have registered their global marks in the Trademark Clearing House (TMCH) but with each never gTLD launch I’m seeing more and more words, perfectly generic terms being successfully grabbed in the Sunrise period. According to the news from Domain.cn on May 29th,all 32 NFL teams applied for its domain name in the new gTLD .Football that launches into general availability next week. Interestingly some applied with their city and team like the BaltimoreRavens.football and the AtlantaFalcons.football while other teams just went with their name like 49ers.football and Bengals.football. If your keeping track 15 NFL teams went with their city and nicknames while 17 just registered the name of their team sans the city. A team that registered just its city and nickname might have a really hard time getting their domain in .football from someone else who registers for example the New York Jets only registered NewYorkJets.football. Someone who owns a private jet service could register say jets.football and put up a site around private plane transport to football games and events. Not one of the 32 NFL teams registered both their citynickname.football name and just their nickname.football domain name. On the college football front just 10 of the over 100 Division 1 football programs registered a .Football domain name. Not only did the regulatory body for college football fail to register NCAA.football but not one of the major football conferences registered a .football domain name. Of course teams and League may registered domain names during the Early Access Program (EAP) or general availability which is cheaper than Sunrise. The domain appears to be owned by Joost Zuurbier who is the Founder of Freedom Registry which operates the .TK registry the second largest domain name registry in the world with around 30 million registrations. The domain name was registered in August 2014 and is in pending delete status. The full UDRP has not yet been published yet just the decision. According to the news from Domain.cn on May 27th,Allegravita published a paper that looks to be a bit troubling for registries looking to do business in China moving forward. The Chinese government is looking to regulate the Chinese domain industry, The MIIT will not interfere with existing domain registrations for unapproved registries; however, new registrations will not be permitted to be sold by Chinese registrars to Chinese registrants. New gtlds look like they are going to have to jump through a bunch of hoops to make sure they are compliant and can be offered in China. Chinaʼs domain name industry has been largely unregulated for more than a decade, and the government recognizes the need to reign in control as Internet security has become a top priority for the new administration. Chinaʼs new regulations concerning domain name registries and registrars are now close to completion. Following several years of ambiguity and rumor, new information emerged in Chinaʼs state-run media on May 12, 2015 which casts light on the eventual requirements. The Ministry of Industry and Information Technology (MIIT) is now actively applying the regulatory code to Chinaʼs registrars. Domestic Chinese registrars are facing new scrutiny right now, and the examination and a re-approvals process will continue over the next five to six months. Many TLDs in common use in China, such as Verisignʼs .com and .net, are not in the latest list of authorized TLDs. This demonstrates that MIIT is playing catch-up with regulating the domain name market in China, which has vastly expanded due to ICANNʼs New gTLD program and the hundreds of new TLDs launching on the internet. Aimed largely at domestic registrars, but also addressing domestic and foreign registries and the TLDs under their control, the new regulations include an examination and approval process to ensure proper observance of the government’s domain name sector requirements. Registries and registrars are required to have a “physical presence” in China FOOTNOTE 2 to achieve full compliance. According to the news from Domain.cn on May 27th,Donuts just I believe set a new gTLD record for selling 21 new gTLD’s on the 1st day of the Early Access Program (EAP) in which wholesale prices are $10K and retail prices range from around $11K to $12,500. Meaning that Donuts took $210,000 in just EAP fees for day 1 of EAP plus many of those domain name also had a premium price. One company, registered 16 domain names on the 1st day EAP spending what basically amounts to what they could have spent to apply for the whole .apartment new gTLD by paying the ICANN fee of $185,000. The Apartment Company of Omaha Nebraska got 16 1st day EAP domain names. According to their website the company is a “privately owned and operated boutique real estate brokerage, syndication, and multi-family property management firm, specializing in multi-family execution, with an emphasis in frontline creativity and applicability. The Apartment Company has been syndicating multi-family investment property since 1992. Before starting the company, the founders and co-chairs each spent 20+ years working in the multi-family and real estate Investment arena. I had EAP day 2 orders on three of these domain names and were pretty surprised and none to happy to see them taken on day 1. So for those that have been banking on getting domain names on day 5 of EAP that strategy’s time my have past.